They’re designed to look like simple transport, but are packed to the gunwales with enough weaponry to take down unsuspecting foes who think they’re easy prey. Why aren’t I writing about cars this week? I am. Well, the term was originally a nautical one. Q-ships — merchant ships with concealed weapons — are the Trojan horses of the sea. They have participated in naval warfare for hundreds of years, but they were widely used against submarines in the World Wars of the 20th century. Their name refers to the Queenstown, Ireland, port where many were based during World War I. But the term has also come to be applied to low-profile, high-performance cars, typically bland luxury sedans with enough power to blow away flashy sports cars without drawing undue attention to themselves. Hyundai has now democratized that idea with its new Elantra Sport — though perhaps it’s overdue, as the company that founded it runs one of the world’s largest shipbuilding operations. The Sport is the most powerful Elantra ever, but it’s subtle. One could be parked next to your desk right now and you’d never know it. It does get a black grille surround, unique headlamps, LED accent lights, small rocker panel extensions and a chin spoiler that’s low enough for me to scrape on a curb, but it looks neither fast nor furious in your rearview mirror. It’s only after it passes you, and you see its dual exhaust pipes receding into the distance, that you realize you’ve been duped. It could happen. The Sport is no Corvette (the car or the ship), but with a very eager 1.6-liter turbocharged four-cylinder, it is quick in the tradition of hot compact hatchbacks, even though it has a trunk. It’s available with a six-speed manual transmission that’s a delight to operate for $22,450, or with a seven-speed dual-clutch automatic with racy paddle shifters that can be had for an extra $1,100, making it the cheapest sedan with more than 200 horsepower – 201 hp, to be exact. Just as important, the Sport gets an independent rear suspension that the other Elantras don’t have. This is mainly to improve its handling, but it also gives it a better overall ride. This kind of update is no small effort, and indicates how seriously Hyundai took the development of the Sport. 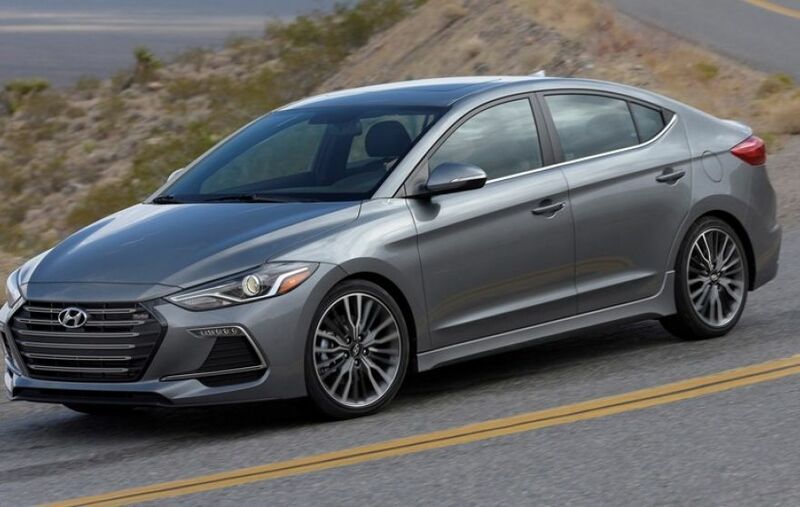 Changes to the Elantra’s dull-but-enormous cabin are limited to mildly racy fonts on the gauges, a couple of strips of fake carbon fiber trim, red stitching, the requisite flat-bottom steering wheel and a set of deeply-bolstered bucket seats that wouldn’t look or feel out of place in a sports car that cost twice as much. Those seats come in handy in the curves, where the front-wheel-drive Sport grips tenaciously and remains as neutral as Taylor Swift’s politics. It’s only at the very limits, not reached on a public road without breaking a few laws, that it loses its composure. But the Sport is about as street-fast as a car needs to be to deliver an entertaining drive...in short doses. Its 30 mpg highway rating is unimpressive for a brand known for its efficiency. Nevertheless, if you’re looking for a boy racer ride without the boy racer style, it’s worth checking the Sport out at your local Hyundai lot. You might like what you see, if you can find one.